Square Enix looks to augment the series with the possibility of a new title. 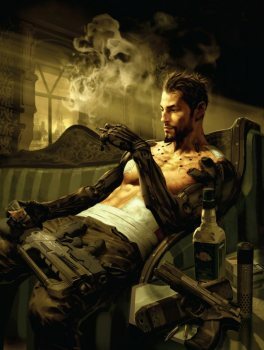 Deus Ex: Human Revolution enjoyed critical success with its depiction of a dystopian future and the social unrest that comes with human augmentation. The game was popular enough that there's a movie adaptation in the works, with a writer and director already attached to the project. But what about a game sequel? It looks like there may be something on the horizon: some sleuthing has turned up a recently filed trademark for the name "Deus Ex: Human Defiance". The European trademark record, which was filed on February 26 by Square Enix, lists a number of classifications that include references to "computer games software", "video games and games for mobile phones", "printed matter", "books" and "online computer game services". Ausgamers verified the filing as genuine, identifying that the trademark was filed by the same firm that applied for Deus Ex: Human Revolution. Additional details are scarce apart from rampant speculation on NeoGAF, where the filing was first discovered. Possibilities include a potential Wii U release of Human Revolution, an HD re-release of the original Deus Ex, or a straight-up sequel after the (eventual) completion of Thief 4. Until we find out more, we'll have to wait and see. In any case, a sequel to the events of Human Revolution looks pretty interesting right now, especially if the boss fights are given some extra attention this time around.